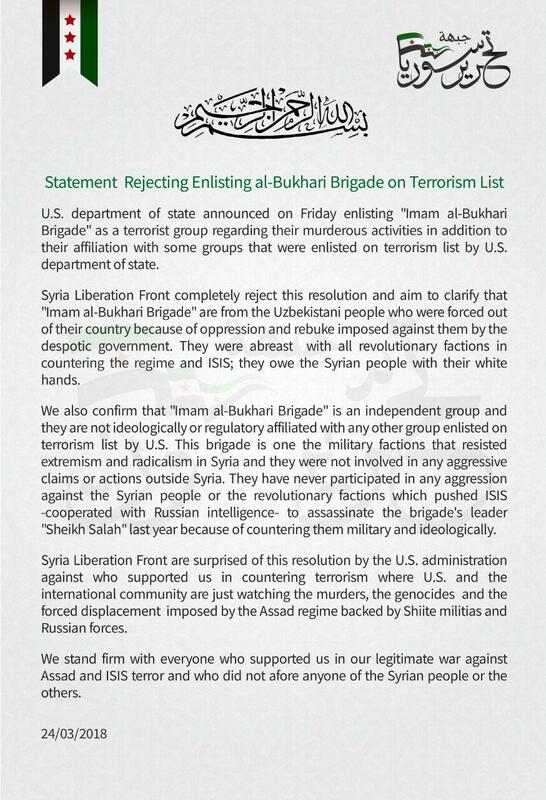 The Imam Bukhari Jamaat (Uzbek: Imom Buxoriy Katibasi, also Katibat Imam al Bukhari) is an Islamist Salafi group fighting in the Syrian Civil War and the War in Afghanistan, composed of primarily Uzbeks, and expressing loyalty to the Taliban movement. The group originally operated only in Syria, where it is allied with other jihadist organisations such as al-Nusra Front and Ahrar ash-Sham, and alongside these other groups it makes up the Army of Conquest, which overran much of Idlib province in north Syria in 2015. Since late 2016, the group has also began to fight against Afghan National Security Forces, and has claimed to have set up training camps in northern Afghanistan. The group is named after Imam Bukhari, a 9th-century Islamic scholar who was from Bukhara in modern-day Uzbekistan. The group was led by an individual known as Sheikh Salahuddin, before his assassination in Idlib Governorate. The Syrian and Afghan branches of KIB have sworn allegiance to Mullah Akhundzada of the Taliban. ^ a b "Main Uzbek Militant Faction In Syria Swears Loyalty To Taliban". Radio Free Europe/Radio Liberty. 12 November 2014. Retrieved 15 October 2015. ^ "Al Qaeda affiliated Uzbek leader assassinated in Syria". Long War Journal. 30 April 2017. Retrieved 10 May 2017. ^ a b c d e Caleb Weiss (9 February 2017). "Uzbek jihadist group claims ambush in northern Afghanistan". Long War Journal. Retrieved 10 February 2017. ^ a b c "Taliban-Aligned Uzbek Suicide Bomber Attacks Shi'ite Village In Syria". Radio Free Europe/Radio Liberty. 21 September 2015. Retrieved 15 October 2015. ^ "Over 150 killed in Aleppo fighting". Long War Journal. 19 February 2015. Retrieved 15 October 2015. ^ "Jihadists celebrate in key Idlib city after defeating Syrian regime". Long War Journal. 27 April 2015. Retrieved 15 October 2015. ^ "Uzbek jihadist group releases footage from Syrian training camp". The Long War Journal. Retrieved 16 November 2015. ^ Paraszczuk, Joanna (November 12, 2014). "Main Uzbek Militant Faction In Syria Swears Loyalty To Taliban". Radio Free Europe/Radio Liberty. Retrieved January 24, 2018. The video, which includes a speech by the Imam Bukhori Jamaat’s leader, known only as Sheikh Salahuddin, sheds light onto the deep ties between some Uzbek militants in Syria and extremist networks in Afghanistan and Pakistan. This page was last edited on 27 March 2019, at 17:00 (UTC).